It blamed the summer cancellations on "messing up" pilot holiday rosters. Ryanair said suspending more flights meant it could "roster all of the extra pilot leave necessary" in October, November and December. Passengers affected by the move will be offered alternative flights or full refunds and had been emailed about advising them of flight changes occurring until the end of October. They will also be offered vouchers of 40 euros (£35) one way or 80 euros return towards on alternative flights on top of any refund. The airline again denied it had a pilot shortage as some have claimed: "In the current year less than 100 of over 2,000 captains left Ryanair (mainly retirements or to long haul airlines) and less than 160 F.O's [first officers] who have mainly left to join long haul airlines." Ryanair added that it had more than 2,500 pilots on a waiting list and had offered jobs to more than 650 new pilots who would be join by May next year. In addition, ten days after saying it was preparing to buy the Italian carrier Alitalia, Ryanair said it would drop the bid to "eliminate all management distractions". Ryanair chief executive Michael O'Leary said: "From today, there will be no more rostering-related flight cancellations this winter or in summer 2018. It said that it has had to scale back its original forecast for passenger numbers in the year to March 2018 from 131m to 129m but it said that it would not affect profitability. 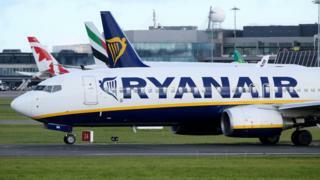 Ryanair's share price rose 3% in London, bringing the rise this year to 17%.